My Mom flew from Ohio to Texas to spend her 85th birthday with me and my family. We had a wonderful family party last night and today I set up a tea and cupcake for her on my patio. Isn't my Mom beautiful? I made some special cupcakes that Mom could enjoy. Here she is ready to blow out the candle! Happy 85th Birthday, Mama! My Mom sent this pretty teapot to me recently that she had found a thrift store. I love the pretty design. You can see a bit of the embroidered tablecloth that my Mom made when I was a baby. It's a treasure. 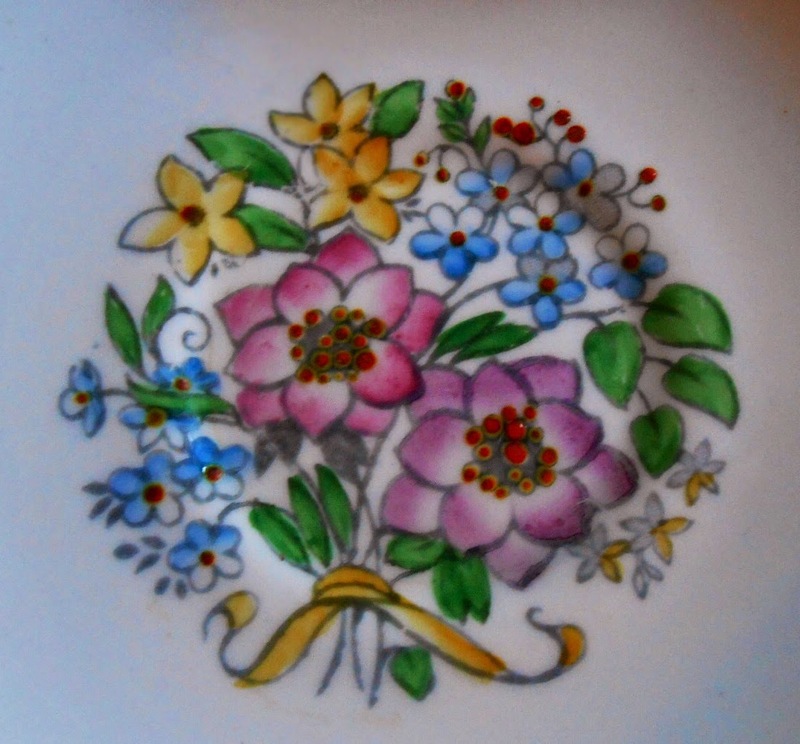 Here's the inside of the pretty teacup that my Mom gave to me that had been in her collection. Cupcakes make everyone happy! These have a delicious strawberry filling and a cream cheese frosting. If you ever need a wonderful cupcake, please try these. This recipe is adapted from www.tidymom.net. I made them when I had a Royal Wedding Party here. Mix all ingredients on low & then mix on high for 2 mins. Pour into paper lined cupcake pans. Bake for 20 mins. Chop strawberries in blender or food chopper until they are thick. It only takes about 4 large berries. Beat whipping cream & vanilla until it starts to thicken. Mix in sugar. Fold in berries. Set aside. Place butter in mixing bowl & mix slightly. Add cream cheese & blend until combined. Add powdered sugar & blend on low speed until combined. Mix on medium until it get fluffy. NOTE: for chocolate cream cheese frosting, add 1/2 cup unsweetened cocoa powder BEFORE adding the powdered sugar. 1. Bake cupcakes & cool. 2. Cut a small section in the center of the cupcake. I used my apple corer & it worked great. Save the extra cake to eat later with some of the filling!!! 3. Replace the tops. I actually just left them off. 4. Pipe the frosting on top of the cake with a 1M tip, or just generously spread, or put the icing in a food storage bad, cut a corner off and pipe on the icing. I sprinkled on some sparkling sugar. Refrigerate the cupcakes until ready to serve. With the summer heat upon us, I wanted a quick meal to throw together, while waiting for my Mom to fly into Texas from Ohio. Because of storms, her flight was delayed! My poor Mom, but she'll be here before you know it. The point of this recipe is to use whatever fresh veggies you have on hand and throw in some leftover meat or chicken. The measurements don't have to be exact. Serve it over some rice and it's dinner! Heat the olive oil and butter together in a non stick skillet. Add the mushrooms, asparagus and onion, crushed red pepper, and sauté for several minutes, until the asparagus is tender, around 7-8 minutes. Add the garlic and sauté for about 30 seconds. Add the cooked chicken and add several shakes of soy sauce and heat through. Serve over the cooked rice and dinner is ready! I'm saving a plate for my Mom! Kathleen is having a "Summer Whimsy" party at Let's Dish! and Sandi is having a "Savour the Summer" Tea Party at Rose Chintz Cottage and I wanted to use one of my favorite teapots that I recently found in a storage box. The sweet Joan Walsh Anglund doll that's sitting on a wicker chair, belonged to my daughter when she was a little girl. My "summer" blocks were a gift from my sister and actually have a watermelon paint design and a tiny watermelon on top. I had to add my favorite lady vase to the setting. She always stays on my kitchen sink area all year long. My Mikasa Berry Delight dishes blend with my teapot. What could be more perfect for my summer theme than a watermelon and feta salad? My youngest daughter-in law made a version of this fabulous salad, but she used arugula. I had some spinach at home and decided to use that instead. It's a refreshing salad for summer and has the coolness and sweetness from the watermelon and a slight bite from the feta. I love this combination and I think you will, too. I hope you try it at your next outing. You could also add some blueberries and have a red, white and blue salad. Combine all the salad ingredients in whatever portion you like. Drizzle with the balsamic dressing and toss. Enjoy! Combine oil and remaining ingredients in a jar. Covers tightly & shake. Pour over enough to coat your salad; save the rest for another time. My outdoor tea today is to honor two important men in my life. They both died far too young, my Dad at age 60, and my hubby at age 64, and both from cancer. I've included some gifts that my Dad gave me...a music box, and a sweet Goebel figurine of praying children. My Dad, named Joe, was 100% Irish and he would've enjoyed drinking his cuppa Joe from my Shamrock colored mug. My dearly beloved enjoyed hunting and being in the outdoors. His hunting vest is my topper, and I've included a reversible hat that I made for him, one of his many caps and my pewter teapot that we served our tea from every weekend. Much as my dear darling was a rough and tumble kind of guy, he was a tea drinker, and he would fix a thermos of tea to take along with him. My dearly beloved Rich swept me away! My hubby enjoyed drinking a big mug of tea, especially in this insulated one. I started making this strawberry pie pie before I was married. It was a favorite of my Dad's, my hubby and our whole family. You can find the recipe here. Thank you for letting me express my love for these two men in my life. Without them, I would not be so richly blessed with my family. I know they are watching over us but it still does not take away the pain of losing them. Michael Lee West of Rattlebridge Farm and host of Foodie Friday is having her Mystery Ingredient Club again. Can you guess what the secret ingredient is??? You'll have to stop by and check out the recipes! 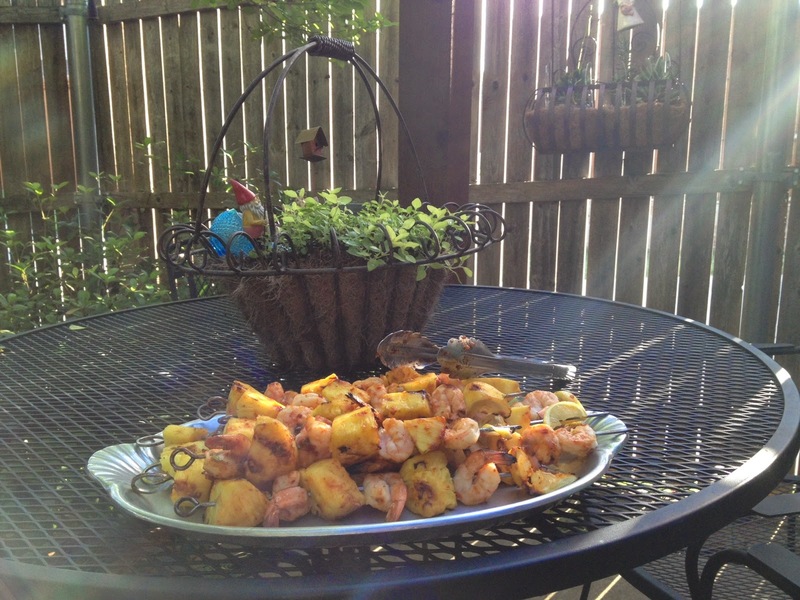 The skewers are quick, and pack some heat and smoke from the chipolte, and sweetness from the caramelized pineapple. I hope you give it a try this grilling season. Put chipotles, adobo sauce, brown sugar and oil in a blender. Grate in zest from lemon; purée. ( I prepared this ahead of time and refrigerated it). Halve lemon lengthwise and slice 1/4" thick. Thread shrimp and pineapple on skewers, finishing each skewer with 1 lemon slice. Mix chipotle purée and scallions in a large shallow dish. Add skewers and rub with chipotle marinade. Grill skewers on oiled grates until shrimp are opaque, flipping once, about 5 minutes total. Thank you Michael Lee for hosting this fun event!